This item will ship within 2 business days. France’s Age of Iron and Glass was marked by such breathtaking artistic achievements as the Eiffel Tower, the works of author Victor Hugo, and the iconic image of Liberty Leading the People. Now those images are captured in stunning gold with the 2017 1/4 ounce Gold Europa Star – Age of Iron Proof. Author and poet Victor Hugo, known for such works as "Notre-Dame de Paris", "Les Miserables," "Odes et Ballades," "Les Contemplations," "Les Chatiments," and "La Legende des Siecles." The world-famous Parisian monument, the Eiffel Tower, built by Gustave Eiffel for the Universal Exhibition of Paris in 1889. The renowned oil painting by Eugene Delacroix, Liberty Leading the People, inspired by the revolution of 1830. This is one coin that hast to be seen to be believed—but it’s available in very limited quantities. So contact GovMint.com for yours, today! The Europa Star series was launched in 2004, with the intent of bringing together the European monetary institutions participating in the European Silver Program. The series includes both gold and silver editions. 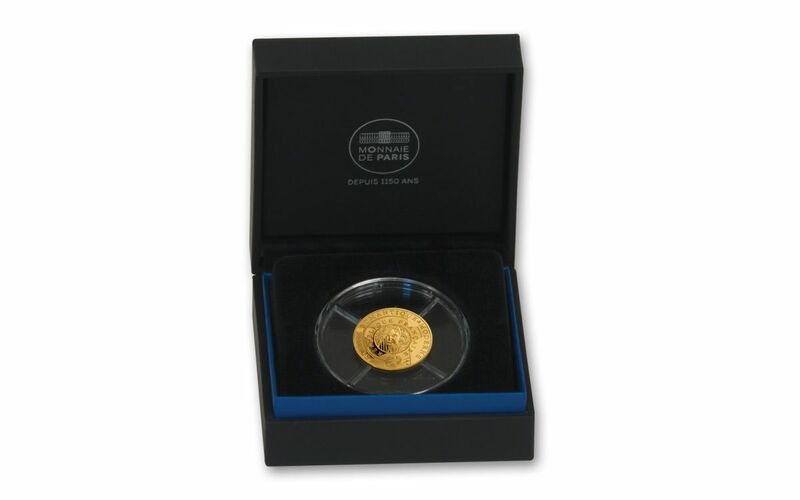 Your ¼ ounce Gold Europa Star, with its gleaming Proof finish, is struck in 99.9% pure gold. It weighs 7.78 grams and is 22 mm in diameter. THE BEAUTY OF THE AGE OF IRON AND GLASS-- While all coins in the Europa Star series are distinctive, the Age of Iron and Glass ¼ ounce gold coin remains a cut above. The obverse of the coin features the star image common to all the coins in the Europa Star Program. In its center of the coin is the flag-draped goddess Europa, and surrounding her are the words "EUROPE ROMANTIQUE & MODERNE," "REPUBLIC FRANCAISE" as well as the date "2017." 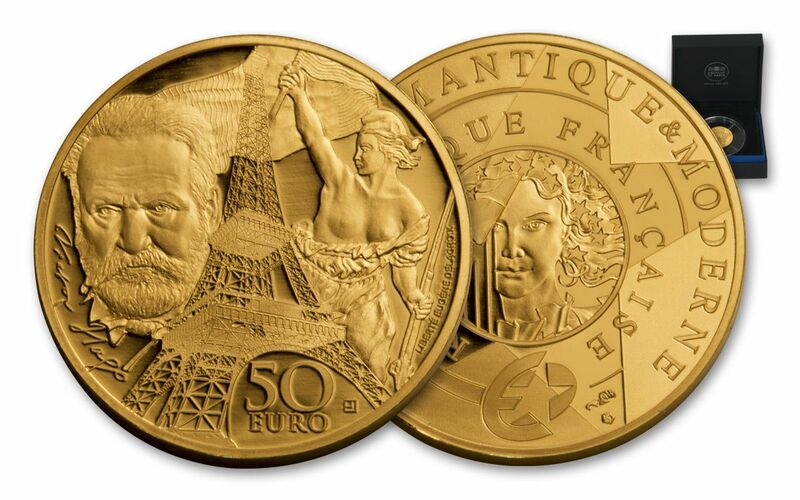 The coin’s reverse features images of the Age of Iron and Glass in France, including author Victor Hugo, the famed "Liberty Leading the People" image, and the technological masterpiece of the Eiffel tower. 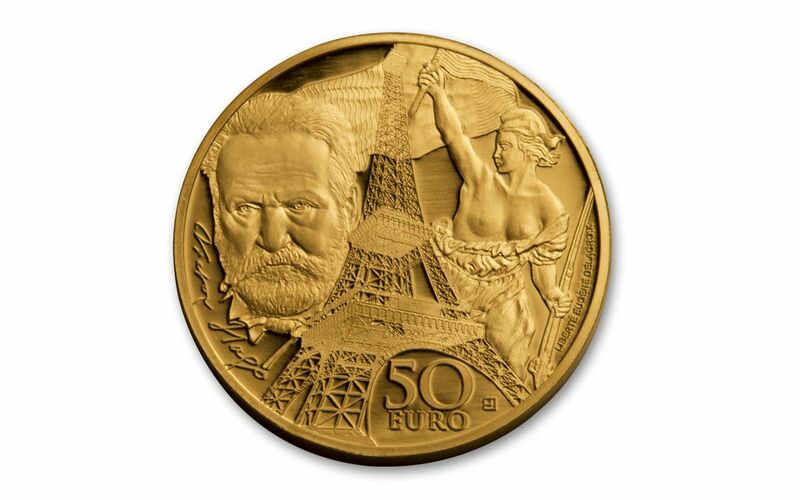 Also on the reverse is the denomination "50 Euro," as well as the signature of Victor Hugo and the iconic French motto "LIBERTE, EGALITE, FRATERNITE." GORGEOUS PROOF FINISH AND LIMITED MINTAGE-- These beautiful coins are rarer still because of their remarkably small mintage of only 1000 pieces, but they are well worth seeking out. Perhaps even more stunning in gold than in silver, Proof coins are distinguished by their mirror-like surface and sharpness of detail. Struck on specially-made planchets, using polished dies, these coins are produced exclusively for collectors, to be treasured for generations to come. AUTHENTIC LEGAL TENDER, DISTINCTIVELY PACKAGED -- Though its value far exceeds this denomination, your 2017 Gold Europa Star is legal tender of 50 Euros, and will be rushed to your door in a mint box with a certificate of authenticity. One of those coins that’s the perfect beginning of an international gold coin collection or the newest addition to an established series, the 2017 1/4 ounce Gold Europa Star – Age of Iron Proof is a beauty to behold. And it can be yours today from GovMint.com…if you act fast. Quantities are extremely limited!